I cannot believe it is already the month of May! The weather here has been just beautiful this week. The grass is finally green too! Now that it’s May, I think spring has arrived at last. 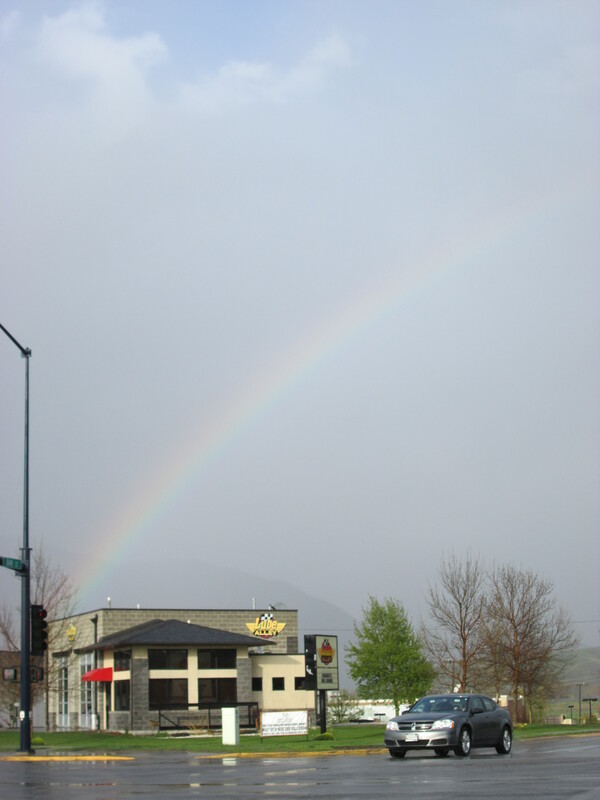 A perfect rainbow for a perfect weekend! 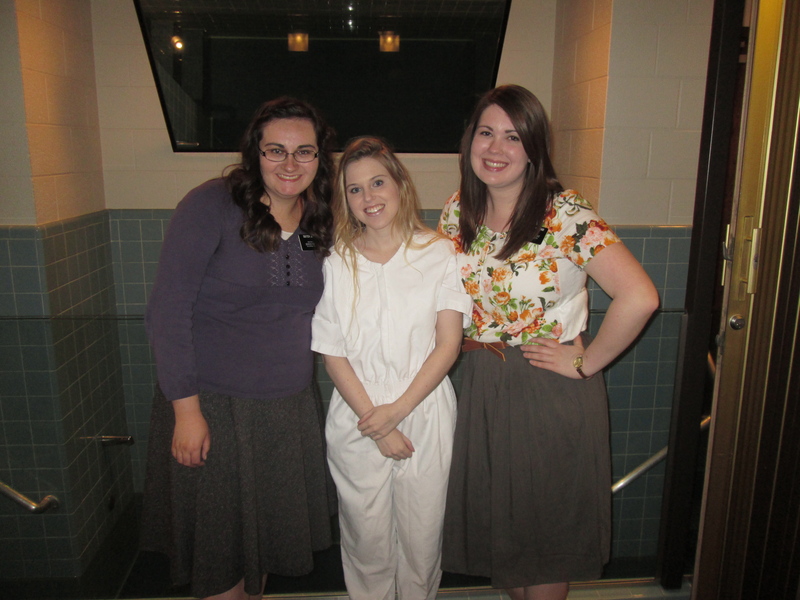 Well, my most exciting news of the week is that one of our investigators was baptized and confirmed this weekend!! Things really could not have gone any smoother during it. We had a great turnout from the ward to support her too. Words cannot even express my happiness for her. She worked so hard to get to this point. She texted us last night, and this is what she said: “I cannot believe how much of a difference I feel today. I am filled to the top of my spiritual glass and I’m trying to hold on to it as tight as possible!”. The power of the Spirit is so real, and it is amazing to see it affect the lives of those we teach. She even asked us yesterday at church if it was allowed for her to go out teaching with us… we were like, “uh, yes! and it is encouraged!”. She is just so great. Our sweet new convert! Best day ever!! The beginning of the week was good, but nothing too crazy really happened. On Monday, I did manage to cut my finger pretty bad on the steering wheel of our car… so lame! It’s taken forever to heal, but thankfully I have lotsa bandaids so I’m taken care of. On Tuesday, our investigator got kinda nervous about her health being good enough to be baptized this weekend and was thinking about postponing. No bueno! We brought some elders over with us and they gave her a priesthood blessing which was really incredible. Then our District Leader did her baptismal interview right there on the spot! She passed with flying colors and was much more at peace about being baptized on Saturday. On Friday, we subbed in Seminary for the teacher, and it reminded me so much of Meeteetse! Except I had like 7 students that were all freshman. It went pretty well I’d say. We talked about Mormon chapters 1 and 2. Mormon was such an amazing man! The lesson gave this awesome quote by President Hinkley: “While I sometimes regret that people do not call this church by its proper name, I am happy that the nickname they use is one of great honor made so by a remarkable man and a book which gives an unmatched testimony concerning the Redeemer of the world. […] Anyone who comes to know the man Mormon, through the reading and pondering of his words, anyone who reads this precious trove of history which was assembled and preserved in large measure by him, will come to know that Mormon is not a word of disrepute, but that it represents the greatest good—that good which is of God”. You can call me a Mormon anytime! Also, quick random related story, but it cracks me up that the members here call us missionaries “the Mormons”. Like, we walk in to a dinner appointment and they say, “oh hey, the Mormons are here!”. I love it. On Saturday morning, we went to the “Morningside” devotional with Vocal Point! They were sooooo good. Then they stayed around a little bit and we got to socialize with them! After the devotional, we ran around and did all the last minute preparations for the baptism. The baptism was beautiful. Our investigator’s mom got some fancy gourmet cupcakes from a place in town, and we ended up taking home the left overs. It was wonderful. 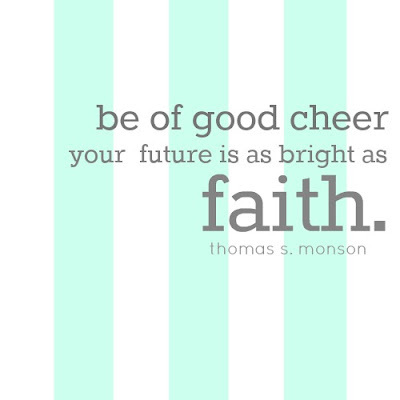 I love being a missionary! It’s the best. I love you all so much, and pray for you daily. Have a wonderful week! !